Philosopher Gilles Deleuze argues that when a body encounters another body, it could happen that “one decomposes the other one and is destroying the cohesion of its parts”. I argue that this other body can also be an artwork, which interferes with the borders of the viewer, where he or she is loosing authority and autonomy over the self. Philosopher Julia Kristeva defines the ‘speaking being’, where an identity is never fixed in place, but always delocalized in its form, composition, structure and language. The subject in discussion is one’s personal territory, combined with the destabilization of physical and psychological state. The collaboration between choreographer Annika Pannitto and me started in 2012. Our project ‘Dances beneath the Oak’ is a sequel of short dances within several group formations, based on different physical principles. We researched, through the disciplines of dance and video we researched how to share a common ground between the performance and the audience and we reflected on how our bodies can relate to space, time and other bodies. We wanted to bring this approach to an art piece and started experimenting with the body and the camera. Out of the first studies we made, in working with dance and video, we obtained our first result, ‘Tuning and Delay’. In this, dance movements are not based on immersion, coming from outside in, but on an emersion, coming from inside out. The movements are channelled into an endless flow, revealed, repeated and retraced. Tuning is about creating a space, entering the space of the other and about the addiction of this tension. Delay is about one catching the traces which the other leaves behind. Here the catcher is loosing the sense of the self, not only by giving a part of one’s autonomy away, but also by being in the same space with the other body. For the final video Tuning and Delay we decided to move away from the visual traces and effects which we used in our experiments, and to focus on the personality of the dancers and their movements and use the original sound of the space to create a more direct environment. In Dances Beneath the Oak we focused on the constructive effects that the surroundings can have on one’s borders, by focusing on collectively creating traces and spaces for others and the self, as one moving organism. With this in mind we experimented with video in different ways of dancing for the camera. Here we decided to have the camera fixed on one point and used the principle of moving the centre of the body, to let the bodies ‘pass by’ the camera lens. We worked with the camera as the fixed and framed eye of the audience. An important question for translating the choreography into a video work was: When is a video a documentation of a dance? When is a video a dance video? And how to create a tension between the two? ‘Consequential Movement’ is our second video work. The dance Consequential Movement is about a physical practice where movement is a chain of events that finds its articulation in the body. 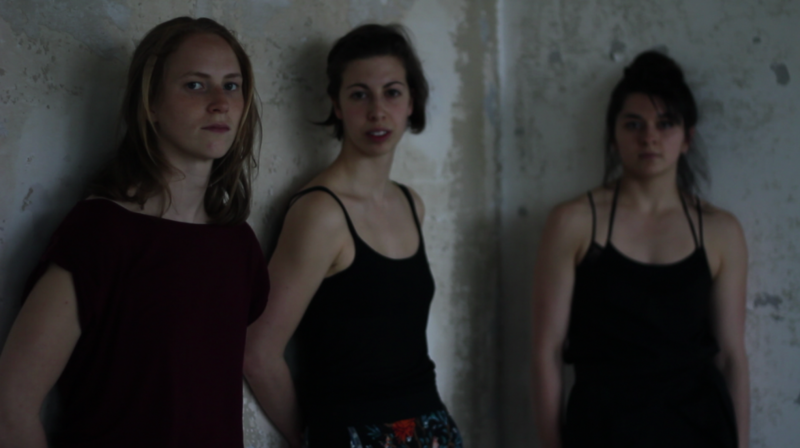 With this last video we explored working with different borders of the dancers together with the camera. We didn’t instruct the dancers to only move for, but also with, the camera. Therefore the camera, and the viewer, becomes involved as a part of the space of the dancers. To explore this further we also worked with the medium of video itself, by showing the contrast between sharpness and blurring of the image, the effect of directing the dancers, and the different roles the dancers take; the change from the formal performer to the informal self. Where moments of pressure and release finds place. This collaborating research project in an ongoing project. For the next step in our experiment we will work on, and with different possibilities of integrating video and dance into a performance and will try to create a dialogue between them.